The Angels MC Hungary was the predecessor of Geronimo MC. Its founding fathers were (Peter, Dagesz, Varjú, Papi, Zsolt, Babár). They all met in 1982-1983 at the V.S.C led by Jack, that later became VMC. One half of the team lived in Rákosszentmihály, and the other half was from Óbuda. After two years of partying and having fun, we got to know Steve, who has brought radical change into our club. He used to belong to the "Hell's in Cegléd". Some of you may know what I am talking about. Four former "Hell's" club members joined us later. The dynamism was interrupted, as we joined the army. By the time we came home, Steve has emigrated to the former NSZK. In 1987, Munkácsi visited Steve in Nuremberg. There he got to know the Nuremberg Angels MC. The Germans were interested about a possible Hungarian chapter, so they came several times to Hungary and spent time to get familiar with our system. They finally decided that we can get the color, for which we can be sure to thank Steve. Munkácsi became our first president. 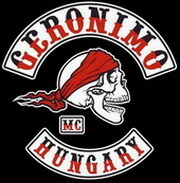 In 1989, after several changes, under the leadership of Peter - at the same time as the shutdown of Angels MC in Nuremberg - the Angels MC Hungary, changed its name to Geronimo MC. Steve decided to leave us and he joined the Uncommon Ghost. Both the Angels MC and the Geronimo MC had many club members. During these years, we have changed our club house several times. We have organized two events in Neszmély. On the weekends, we have had major gigs with live music. After the shift of regime, countless newspaper articles and TV program presented the club & its club members famous and dreaded. In 2005, an enthusiastic team led by Zsiga- who was one of us- founded the "Szalkai chapter" in Mátészalka. In 2006, we had to leave the legendary clubhouse, and we had to find a new place. We chose a former plant, and started building the new clubhouse - which is now the 4th in the club's history. Some members no longer believed that we can have a new beginning, so they left the club. We have replaced their place with enthusiastic young people. The club house was ready by April 13, 2007 and we held a house inaugural party, called "Friday 13th Party". The Islander Mc Bikers merged into our club in 2007, through which we became stronger. The Mátészalka chapter (after a lot of work) finally won full membership, and became Geronimo MC East in the summer of 2008. The Geronimo MC celebrated its 25th (!) anniversary in 2014. There are three chapters, at the present time. Its members use only Harley Davidson motorcycles. The materials found on this page belong to the Geronimo MC Hungary. Any full or partial use of materials, may lead to serious legal or health problems.